When Nicole Castro, the most popular girl at her high school, has her face splashed with acid, her classmate, loner and brilliant hacker, Jay Nazarro, does more than just gawk at her. He decides to find out who did it. The deeper he digs, though, the more he falls for Nicole…and the more danger he’s in. Everyone is a suspect—even Nicole herself—and whoever did it seems ready to strike again. 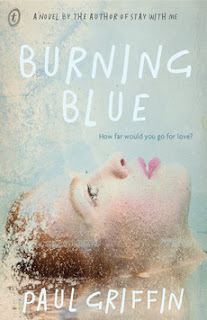 Told by Jay and through Nicole's diary entries, Burning Blue is described as a psychological thriller, but I think it's more of a contemporary YA romance and mystery in one. Though it started out slow (even though it begins with the catalystic event, it being retold to the reader made it lack immediacy), and both Nicole and Jay are kind of acerbic to begin with (Nicole for good reason), it's intriguing enough to continue reading. It's definitely one of those books that is - I hate to use the dreaded word-that-isn't-actually-a-word "unputdownable" - very difficult to put down once you reach a certain point. It's thoroughly original, and certainly did not end as I expected it to. I enjoyed all the hacking stuff (there's a lack of that in YA, oddly), but really wanted to hear more from Nicole. Though Burning Blue is quite dark (and I'd definitely recommend it to older YA readers), it's comparatively not as intense as the author's previous novels. I read Ten Mile River by the same author several years ago, which I enjoyed but I think pales in comparison to Burning Blue. I had a copy of the author's second novel, Stay With Me, which I never ended up reading because, after hearing the author do a reading of the novel (which was actually excellent), knew it would be too unpleasant for my reading sensibilities. I think the characters of Burning Blue are a little more mainstream than the characters of the first two novels (Ten Mile River is about kids who have escaped from a juvenile detention centre; in Stay With Me the teenaged protagonist commits a murder), so I think it's probably the most accessible of Griffin's novels for a wide audience. There is an incredible twist. It is somewhat made-for-TV-movie ridiculous, which I love, but in case you don't, rest assured it makes sense within the novel. It's really quite startling. It took me a while to warm to Burning Blue, but it definitely gathers momentum and is an intense but ultimately uplifting read.